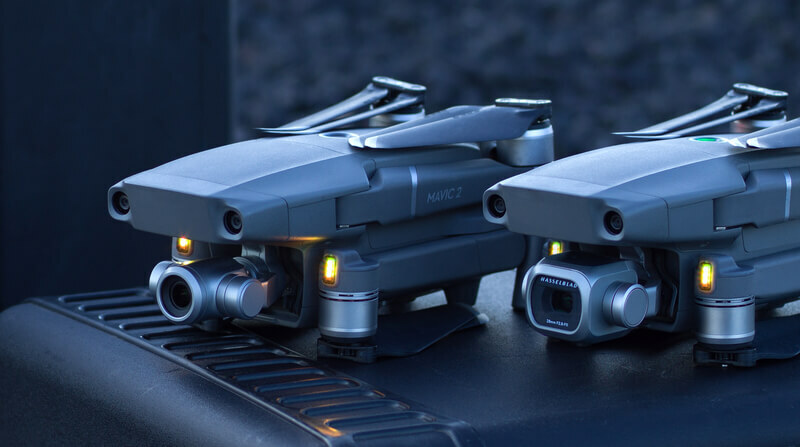 DJI, the world's leader in civilian drones and aerial imaging technology, today introduced a new era for camera drones with two additions to its iconic Mavic series: Mavic 2 Pro, the world's first drone with an integrated Hasselblad camera, and Mavic 2 Zoom, the world's first foldable consumer drone with optical zoom capability. The Mavic 2 is the most advanced DJI camera drone ever built, designed for professionals, aerial photographers and content creators. Incorporating the iconic folding design of the world's most popular Mavic Pro, the Mavic 2 is a powerful platform with new gimbal-stabilized cameras and advanced intelligent features like Hyperlapse and ActiveTrack for easier and more dynamic storytelling. With an impressive flight time of up to 31 minutes and a more stable video transmission system, Mavic 2 delivers the optimal flight experience for capturing epic shots. Co-engineered in partnership with Hasselblad, the world's leader in medium format photography, the Mavic 2 Pro is the world's first drone with an integrated Hasselblad camera for outstanding image quality with superior light and color performance. Housing a 1-inch CMOS sensor with a 10-bit Dlog-M color profile, the camera captures four times as many levels of color per channel compared to Mavic Pro to provide maximum flexibility for photo and video editing. The Mavic 2 Pro can capture 20-megapixel aerial shots with utmost color accuracy using Hasselblad's unique Hasselblad Natural Color Solution (HNCS) technology, while an adjustable aperture from f/2.8-f/11 provides more control across a wide variety of lighting conditions. With 4K 10-bit HDR support, the Mavic 2 Pro can be plugged into a 4K TV with HLG and will play back footage with the right color tones. Powered by a 1/2.3-inch CMOS sensor, the Mavic 2 Zoom is DJI's first foldable consumer drone with zoom, providing a dynamic perspective that ushers in a new era of creative storytelling. With the Mavic 2 Zoom, you can get closer to your subject at a moment's notice by combining two-times optical zoom (24-48mm) with two-times digital zoom to simulate a 96mm telephoto lens that captures lossless video in full HD resolution. Hybrid auto-focus on the Mavic 2 Zoom combines phase and contrast detection for higher focus accuracy with an increased focus speed of up to 40% faster than before. Shoot vivid 12-megapixel photos or take advantage of the new Super Resolution feature that uses optical zoom to automatically capture and stitch nine photos together for a highly detailed 48-megapixel image, making it an ideal option for landscape photography. The Mavic 2 's redesigned, more aerodynamic airframe reduces body drag by up to 19% compared to the Mavic Pro, allowing the Mavic 2 to fly at speeds of up to 44 mph (72 km/h) in Sport mode. Combined with a more efficient, quieter propulsion system and noise reducing propellers, the Mavic 2 has a maximum flight time of up to 31 minutes. To ensure crisp photos and smooth, shake-free footage, the Mavic 2 houses an ultra-precise three-axis mechanical gimbal to stabilize its camera even during high-speed motion. Photos and videos can be saved directly to the drone using its 8 GB onboard storage. All DJI users have control over how their data is stored and managed, as part of DJI's commitment to protecting its customers' data.